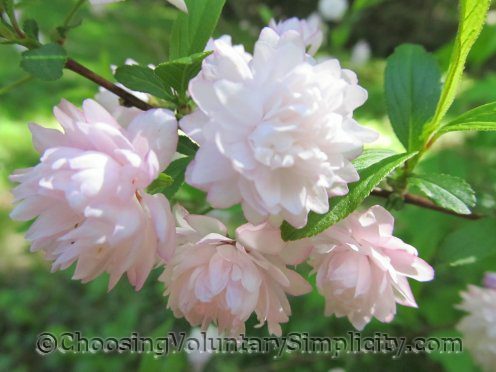 There are two types of flowering almond. 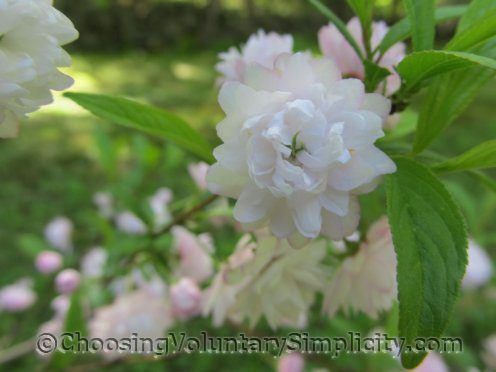 The dwarf variety, Prunus glandulosa, grows to about five feet tall and has white or pink flowers that appear in mid-spring. The taller variety, Prunus tribola, produces pink flowers in early spring and the bushes can grow as tall as fifteen feet. Both varieties can have double flowers. I have two flowering almonds… both are the dwarf variety and both have double flowers, but the flowers on one bush are a slightly deeper pink. 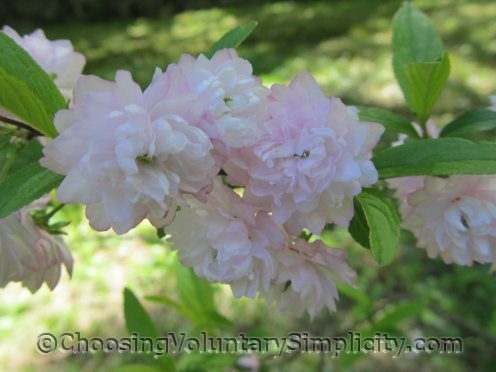 Flowering almond bushes are amazingly easy to grow. They like full sun to partial shade and do best in slightly acidic, well-drained soil. Flowering almonds like moist (but not wet) growing conditions and appreciate a thick mulch. During dry periods they should be watered regularly. Flowering almonds are special to me because they were so special to my mother. They were… without a doubt… her favorite flower. 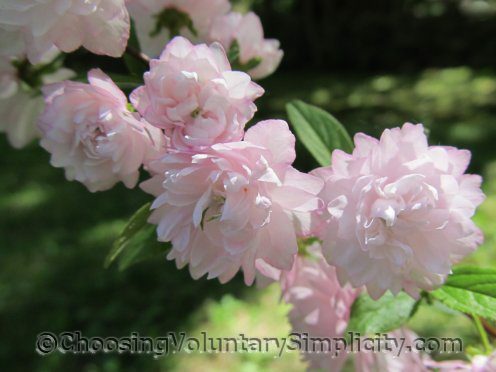 Most mature flowering almond bushes will have tiny offspring growing around the outer edges of the bush. These tiny bushes can be carefully dug up and planted… both of my flowering almonds were started from offshoots in my mother’s garden. 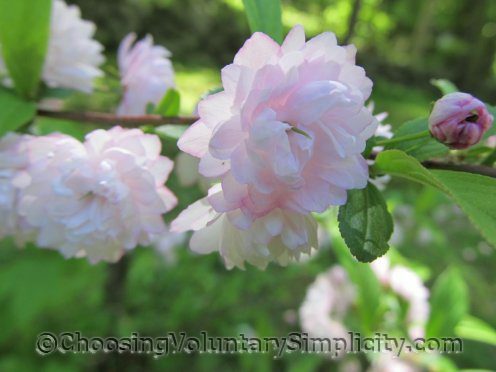 Pruning the bush after flowering will encourage it to produce more flowers another year. 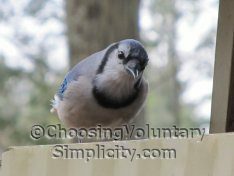 I mostly cut off any dead wood and crossed branches and do a light pruning over the entire bush. Flowering almonds can be grown in zones 4 through 9. A friend gave me a shoot off of her flowering almond years and years ago. It was very small, and I had problems every winter with the fragile stems getting broken. A few years ago after an especially bad winter for it, I moved it away from the house to the front of a rock wall at the edge of the lawn. My husband forgot it was there and mowed it. I put rocks all around it to mark where it was, and lo and behold it is coming back. It is a hardy little thing. The little pink pompom flowers are so precious, I can’t wait for it to get big enough to bloom again. I love your posts on growing things! I went out today and bought a small one of these just on the strength of these pictures and this post. The one I bought even had a very few pompom type blossoms and I could see just how beautiful it is going to be. I had never even heard of these before but my gosh – aren’t they beautiful. Dawn, I had a similar experience with a small bush that got accidentally broken off (mowed down by my teenage son). I was positive it was gone for good but the next year there were new shoots coming up from the base. Maybe even such drastic pruning strengthened it… who knows? Pretty though, aren’t they? You have so many beautiful plants. Your yard must be a delight to see. I have to second Dawn’s statement about loving your posts on growing things. Of course I love your entire site too. ;-> I wish you were my neighbor!